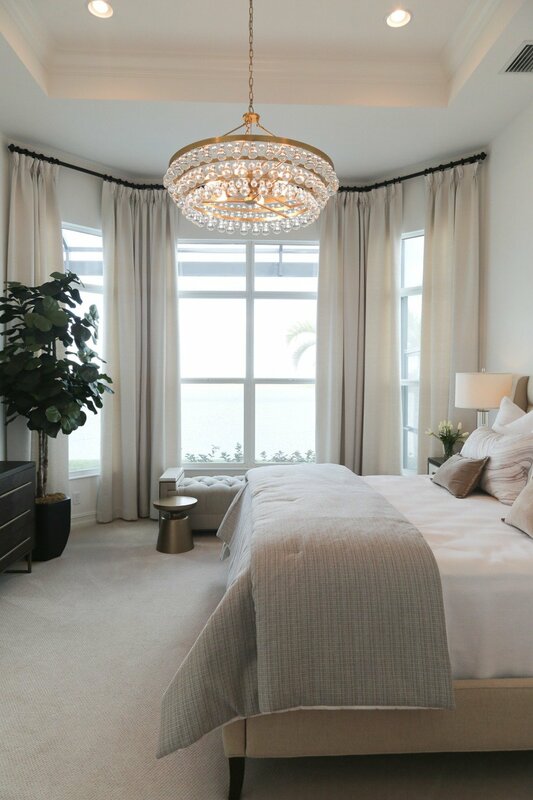 I recently returned from a quick trip to Naples, Florida Parade of Homes and I am so excited to share with you guys all the beautiful design ideas and trends that I saw during the tour. One of the reasons I wanted to go specifically to Naples, Florida is because the design and architecture in that area is really amazing. 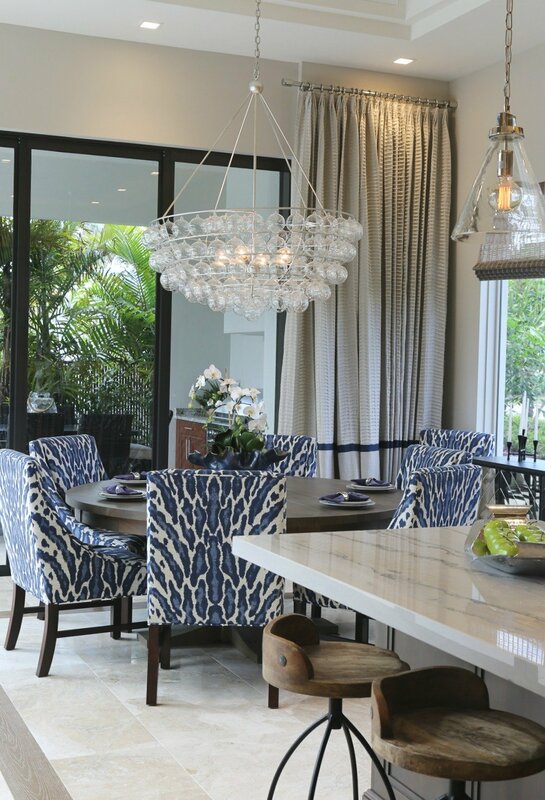 You’ll find such a beautiful mix of old Florida-West Indies architecture and design influence mixed with modern. Over the years, I have been to Naples countless times to visit family and it’s one of the areas in the country that has inspired me the most when it comes to architecture and design. 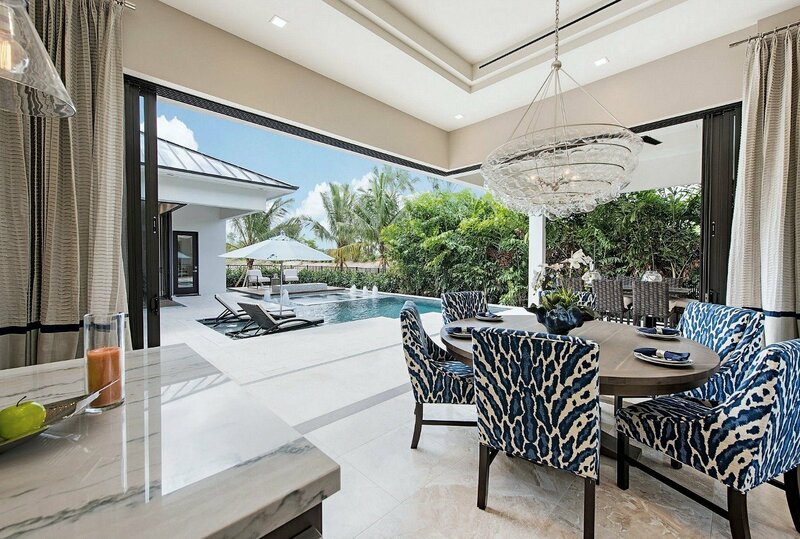 Naples is one the oldest communities in Florida with some of the priciest real estate in the country. Naples is also on the Gulf, so many of these homes are on the beach mixed with some of the most beautiful natural tropical landscaping and 100 year old Banyan trees that just take your breath away. The architects and builders in Naples do such an amazing job of designing homes with that unique to Naples mix of old Florida/West Indies influence/modern coastal design that Naples is known for. 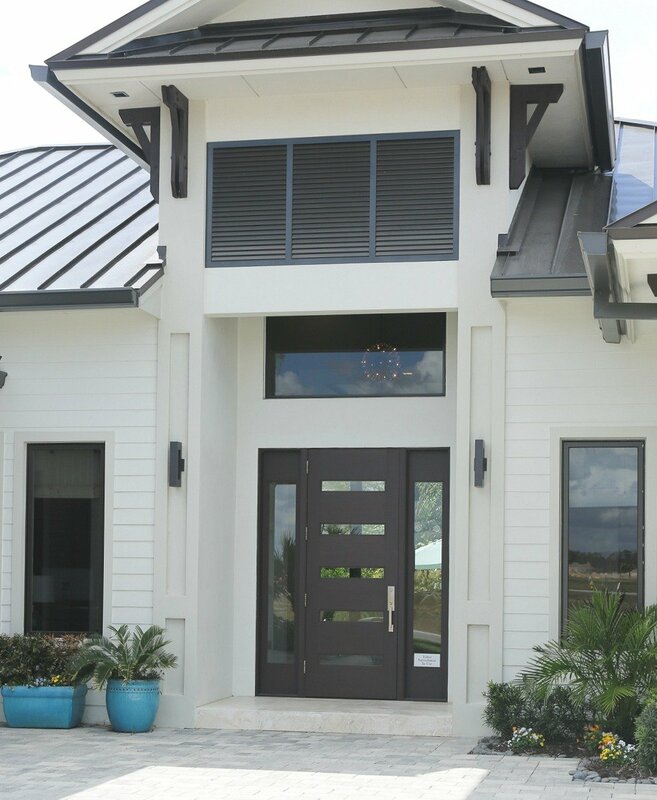 That mix of West Indies and modern is my personal design style and it’s not always easy to do, which is why I really wanted to see this Parade of Homes. I wanted to see what the builders and designers are doing today to find inspiration for myself and my clients. 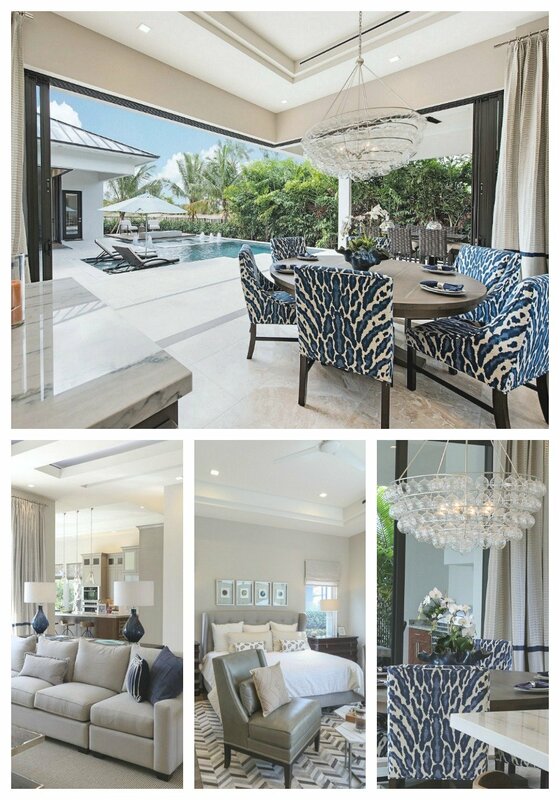 The Parade of Homes was held in the Naples Reserve new community south of old town Naples. If you live in South Florida and are looking for a new home, check out this beautiful area in between Marco Island and old Naples. So let’s jump into the tour recap! My favorite home hands down during the tour was built by the KTS Group. This home was one of the most well laid out and designed homes taht I have ever seen. 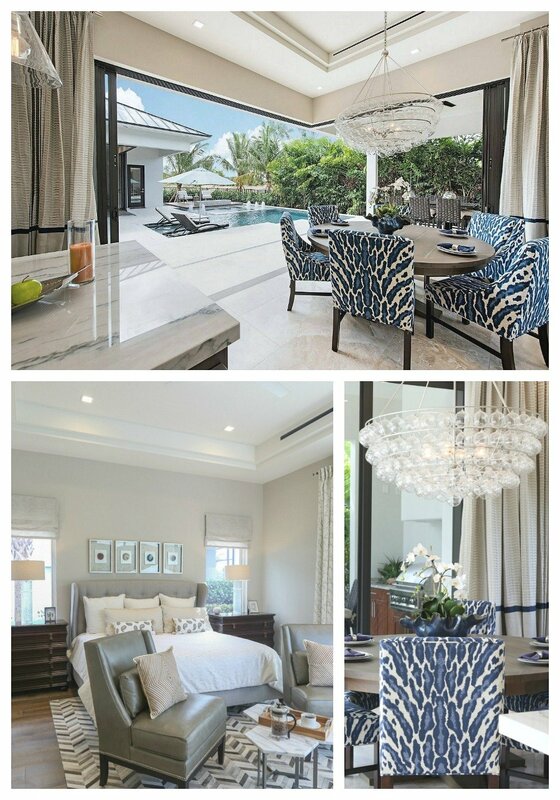 This home to me really epitomizes that true Naples design style and mix of West Indies/old Florida/modern. I also loved the tall ceilings and a beautiful open concept. Notice how the kitchen area to the right is still part of the open main room design but still somewhat off from the living room. I really like that idea so much! You can see better what I mean about the kitchen being open but slightly off from the living room. By the way, the main wall color throughout this home is Sherwin Williams Worldly Gray and it was gorgeous in this home! Just the perfect color. I had so many things that I really loved in this home but my favorite was the huge open kitchen design and the beautiful design work. Really extraordinary! I mean just look at this!! 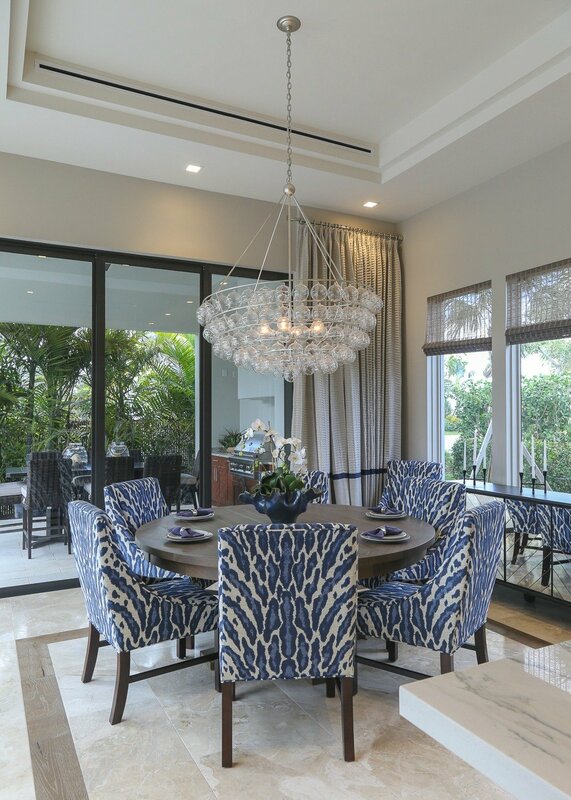 I’m still dreaming about that gorgeous Navy animal print on the chairs and that dreamy chandelier! Wow! The view from this kitchen was really incredible and again, a testament to the design from KTS Group that they really did an amazing job of every little detail including the beautiful views from all of the spaces. 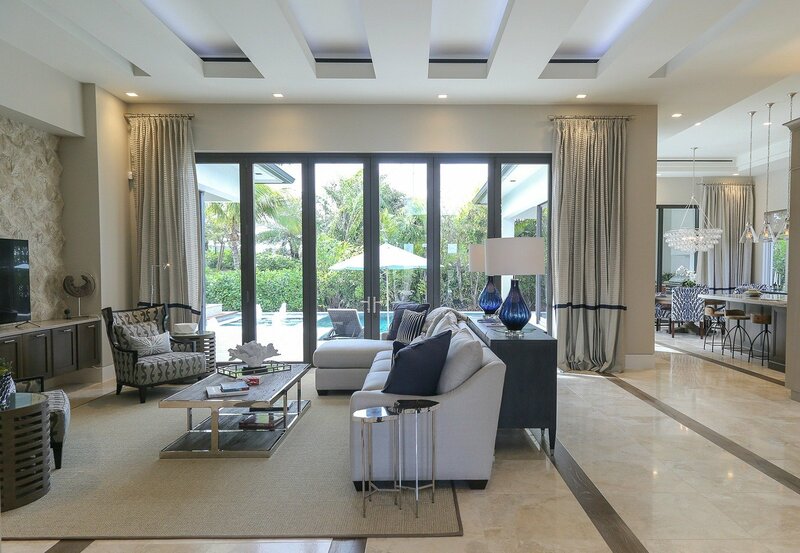 The doors to the pool/patio area were not open when I toured the home but I found the shot with the doors open on the KTS Group website that really shows you the view. 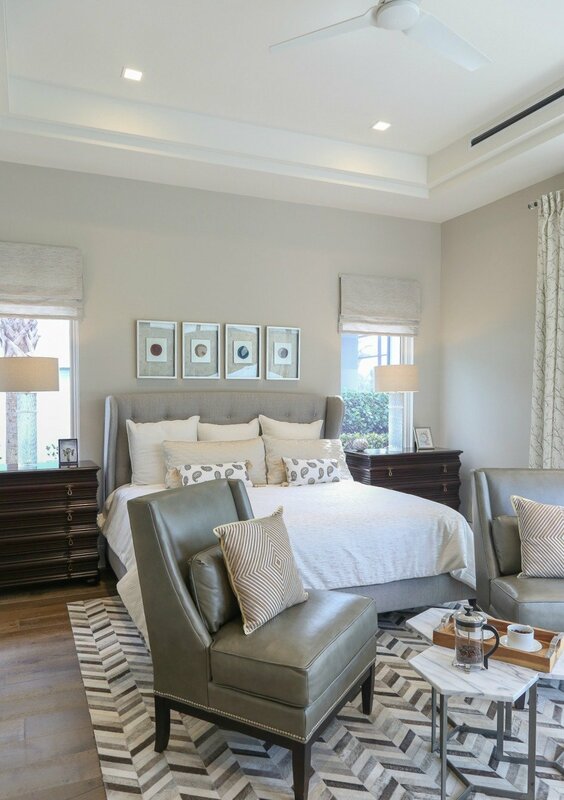 The master bedroom in this home was so pretty and again, Sherwin Williams Worldly Gray is just stunning in this bedroom that has so much natural light. 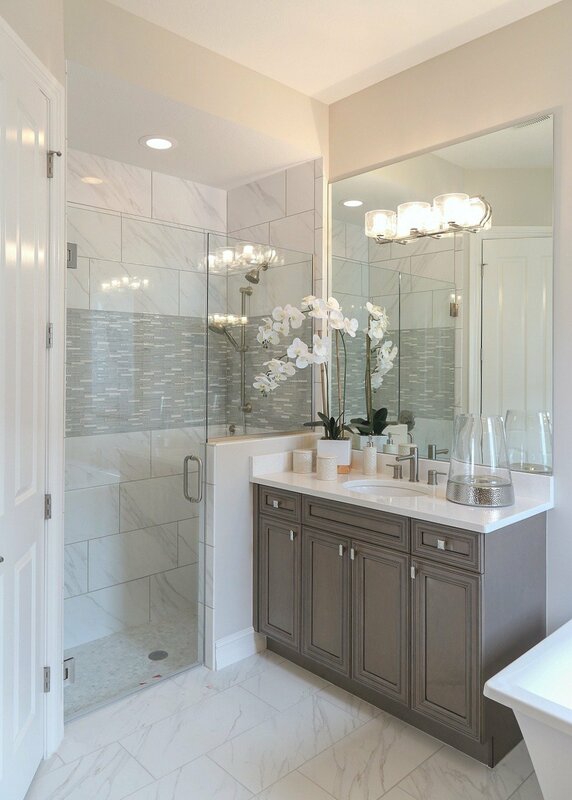 The master bath was modern, sleek and absolutely breathtaking. 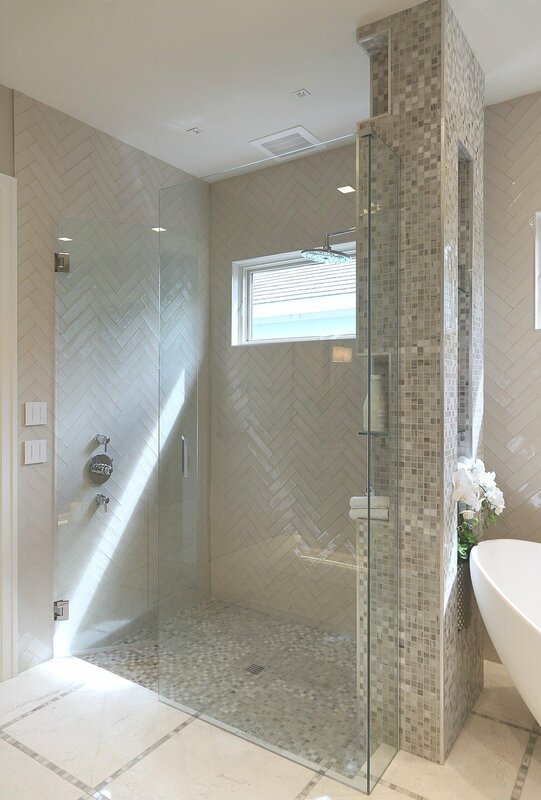 I especially loved the herringbone tile color and pattern in the huge walk-in shower. As you can tell, I just loved the KTS Group built home so much and I think what they are doing as I look through some of their other projects is so amazing! Right next door to the KTS home is the____ home, which I also loved. I walked in the door and I instantly fell in love with the whole home wall color. The color is Sherwin Williams Liveable Green. Isn’t it stunning? I loved the driftwood light colored wood tile floors in this home so much. 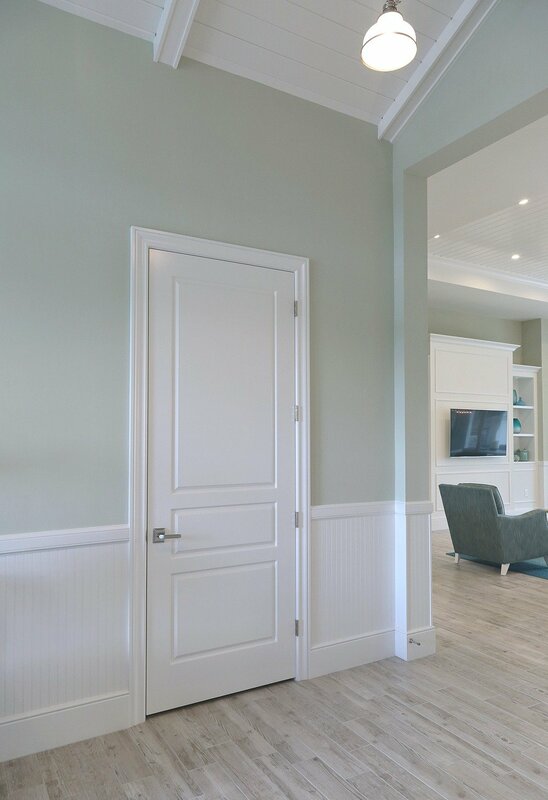 Mixed with the wall color, this home was so light, airy and serene! Notice the color palette in the decor with all these beautiful shades of green. I love the mix! From a design point, I saw a lot of beautiful layered and styled homes during the tour. 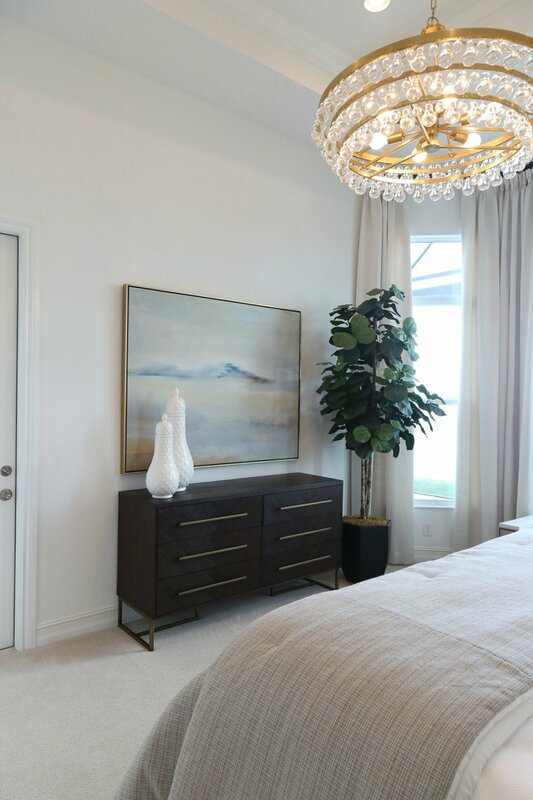 I loved how all the homes were decorated very light and airy and I saw some of the most amazing light fixtures like this one in this beautiful master bedroom. 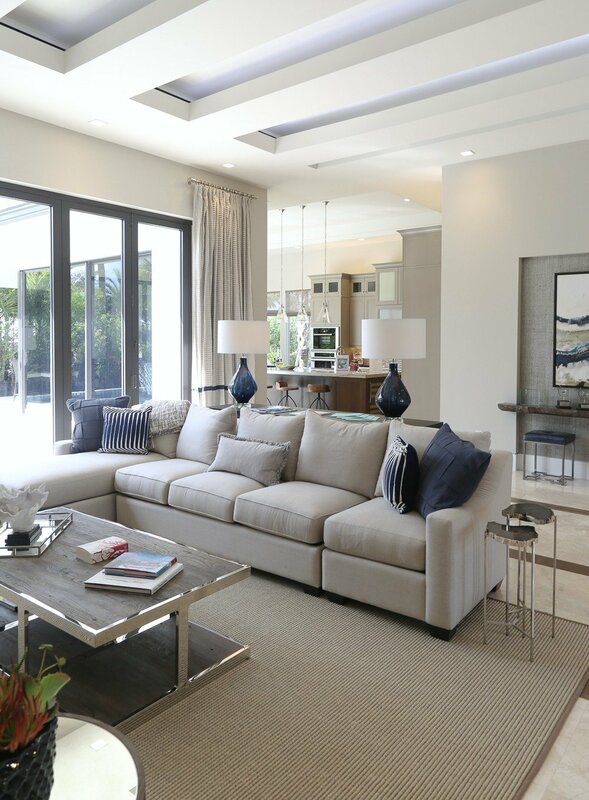 The layout in this living room was really smart and I never think of adding a large long bench to the conversation area but in this space, it is stunning! 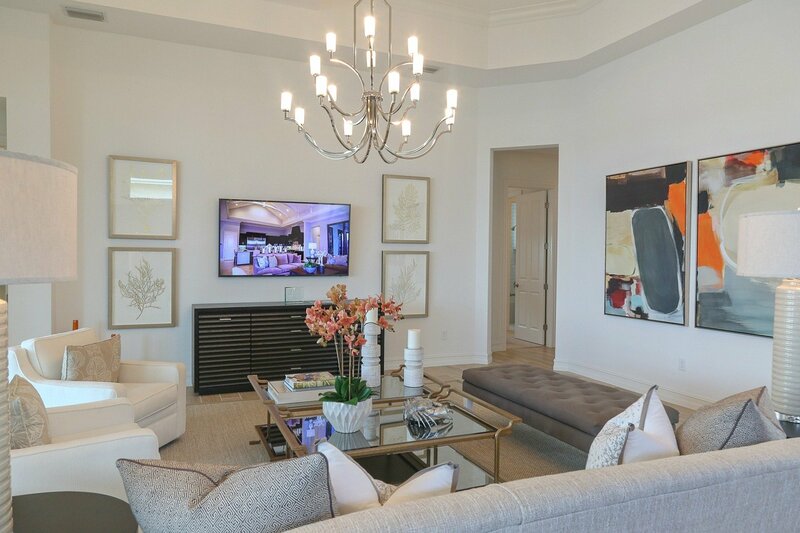 I loved the art in this home! One of the things that I noticed in almost every home during the tour was stained/natural wood cabinetry. I thought for sure that I would see a lot of white painted cabinets in the kitchens and bathrooms but I didn’t. I think stained/natural cabinetry is coming back around friends! I loved this natural ash colored stain. I also saw a lot of very smart layout ideas including this open double desk area at the end of hallway in one of the homes. This area was right at the backdoor and so smart. 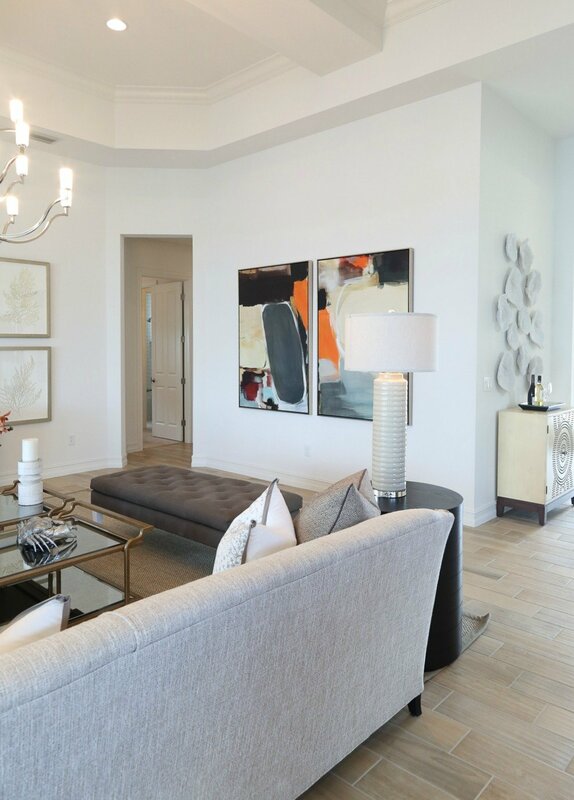 After I finish touring the Parade of Homes, as I was driving back into downtown Naples, I ran across another community called The Isles that I stopped and toured several of the model homes. This was also a new planned community that I loved. 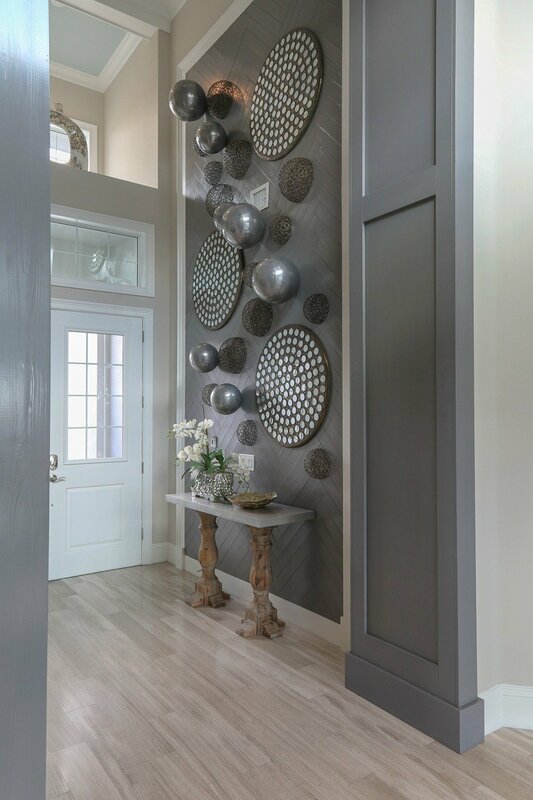 I will be doing a separate post on that community but before I closed, I wanted to show you this incredible entryway accent wall that just was incredible in person. Really amazing! I have so many more images from the tour to share with you guys but I have run out of room here. I will being doing a part tour of this recap in the next couple of weeks to share more. 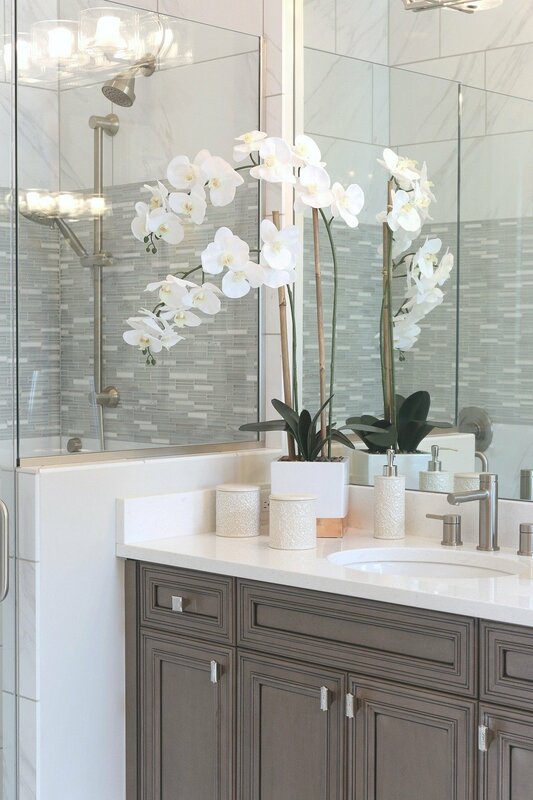 If you have never seen my Salt Lake City Parade of Homes recap, you will for sure want to check that out for even more inspiration! Do you know where the kitchen table and chairs came from? Love! Do you know what color the kitchen cupboards are painted?? Looks the same as the walls, but thinking it has to be different? We are debating on a color for our cupboards and really like the color they picked as it doesn’t look white, but still light. In Florida most rooms have ceiling fans I noticed the models had chandaliers. 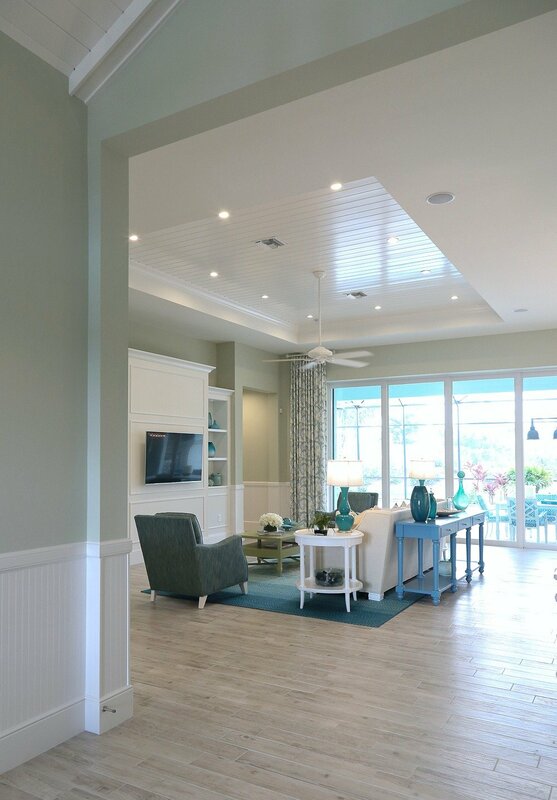 Can you offer advise on newer ceiling fans that are still fabulous old florida modern without being clunky? This was great, thanks for sharing. My sister and family had a summer home in Naples and lived in Chicago. After leaving Chicago, they sold their home in Naples. 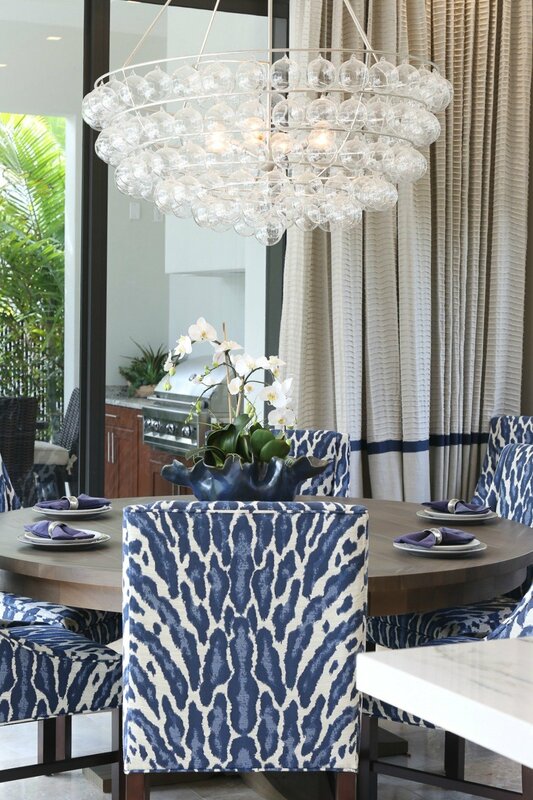 Great houses, can you please tell me the name of the navy animal print designer?